Earl has been busy watching TV and looking over all the information I put together on Colorado Springs. I have been attacking the cross stitch for the dining room. Pierre has been sleeping and learning tricks. I am trying to teach him sit and sit up. He has learned “Down” particularly the one time when he was on the counter and I came after him with an angry look on my face. He also hears “Down” at night when I am working on the computer and he stands up, paws me, and pleads to be fed early. I eventually give in. We did have a full day on Wednesday with our friends, Bob and Marge Card, of Sunland Springs. They have had a home in Colorado Springs for more than 50 years and know the area well. After we arrived at their home, the Cards drove us to the Cripple Creek Mining District where we visited the remains of the American Eagle Mine, drove past the Independence Mine, and traveled around Goldfield, Victor, and Cripple Creek. 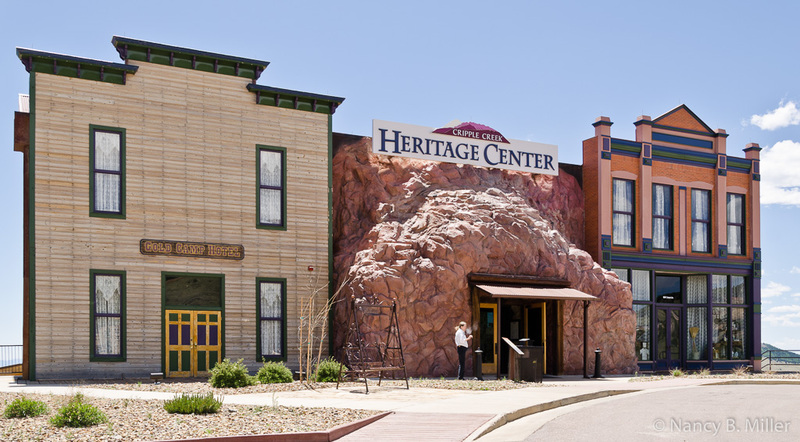 We stopped for lunch at the Double Eagle Casino and ended our area stay with a visit to the Cripple Creek Heritage Center. The Cards are superb photographers and theirs and our cameras received a lot of use. Now for a few details and a little history. Surrounding the American Eagle Mine Overlook, located near Goldfield, you find the modern strip mines of the Cripple Creek and Victor Gold Mining Company. It is owned by AngloGold Asharti Ltd., one of the world’s largest gold processors. We spent an hour at the Overlook enjoying the views of the modern mine. The American Eagle Mine was started in 1895 by Winfield Scott Stratton, a carpenter who became the Cripple Creek Mining District’s first millionaire. Today you can see the remains of the shifter’s office, superintendent’s house, blacksmith forge and shop, and original head frame and hoist. Signboards around the property explain about the mine and mining process. Stratton ran it under the Stratton Cripple Creek Mining and Development Co. By 1902, it was at 1540 feet deep and had the deepest shaft in its time. It was also the district’s highest mine at 10,750 feet above sea level. It involved three shafts that connected to mines on adjoining properties. The wooden head frame had the unique feature of a detaching hood. If the hoistman overwound the hoist cable, this detachment would prevent the miners from being injured. American Eagle was worked sporadically until 1924 when it was reopened by Stratton Leasing Inc. 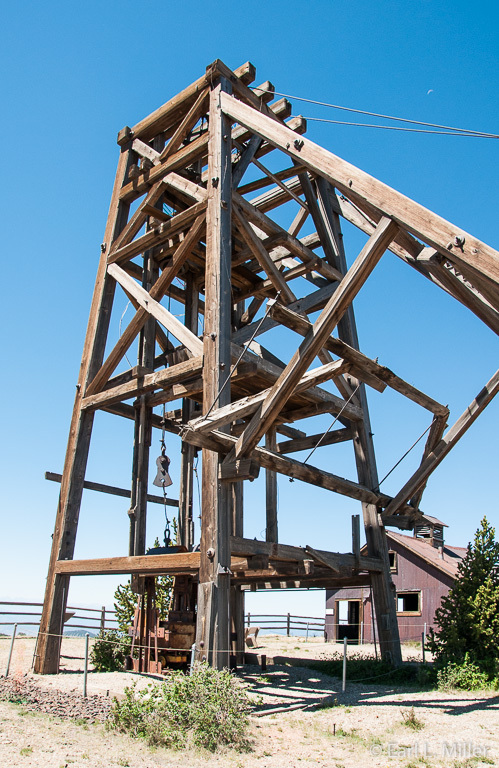 In 1936, a rich strike was discovered at the 1900-2100 foot levels. Gold ore at that time was worth $7 an ounce. In 1940, the mine was closed permanently. Stratton was also the owner of the Independence Mine which you can see from the road. It’s located on the south slope of Battle Mountain. He purchased it and the Washington Mine on July 4, 1891. Both mines received their names because of the holiday. One gold boulder from the Independence was worth $60,000. Stratton used this money to sink a chute tapping into a rich vein. In 1892, he hit gold in the Washington Mine. In 1900, he sold the Independence to the Venture Corp. of London, England for 11 million dollars. Shares were sold on the London Stock Exchange and the sale made Stratton the area’s first millionaire. The Independence Mine produced more than 28 million in gold up to 1915 when the property was again sold. Stratton believed the Cripple Creek District gold area was shaped like a wine goblet. He thought the surface ore deposits narrowed then focused deep underground into a main stem of an extinct volcano creating a bowl of gold. He used six million of his 11 million dollars from the sale to purchase claims for his big dream. But he died in 1902 before finding it. We also passed the Mollie Kathleen Mine. In 1891, Mollie Kathleen Gorner spotted an interesting rock formation that turned out to be gold in quartz. She became the first woman to file a gold claim in her own name in the Colorado gold camps. The mine has been conducting tours for more than 50 years. We intend to go on a tour on a future trip to the Cripple Creek area. This is the country’s only 1000 foot vertical shaft gold mine tour. We drove around Goldfield and Victor photographing ruins of cabins and a home that had an actual toilet potty collection in the front yard. Portland Gold Mining Company platted Goldfield in 1894. It was built to house the company’s employees and still has inhabitants. Victor is known as “The City of Mines.” Most of the District’s 21 million ounces of gold came from these mines. One, the Ajax Mine, produced 1,300,000 ounces of gold. The Woods Brothers founded the Gold Coin Mine when they dug a foundation for a hotel and found a gold vein. Today’s visitors to Victor can visit the Lowell Thomas Museum and take a tour of a modern mine. These stops are also on our future schedule. At the Double Eagle Casino, we had lunch at their café. You’ll find salads, sandwiches, and such entrees as chicken fried steak. I spotted lots of slot machines including a penny machine which took up to 40 pennies at one time. We drove past the police station. One of my memories from our 1973 Colorado trip relates to that building. On its front door was printed “Office Hours: 9-5.” With 12 casinos now in town, they are now probably running the station 24 hours a day. 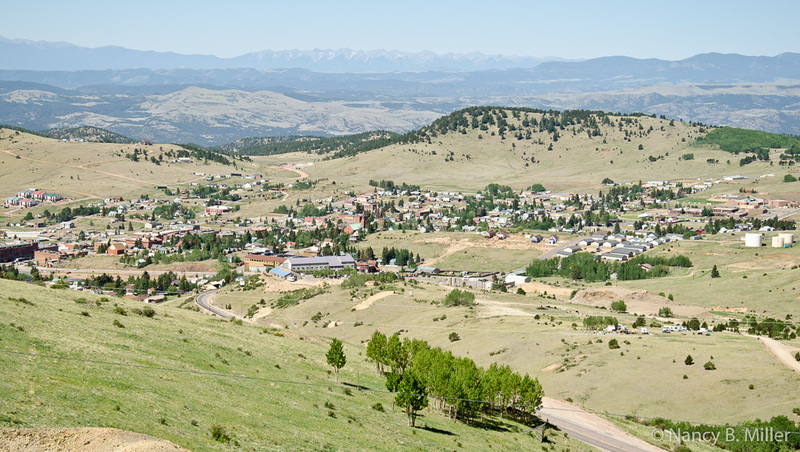 Cripple Creek is the heart of this area when it comes to attractions: railroad train trip, jail museum, brothel museum, district museum, even Donkey Days coming up June 23-24. We visited the Cripple Creek Heritage Center. This is a combination of a convention and visitors information center and fascinating museum with three floors of exhibits on the town’s history. Some are interactive. Even if they charged admission, which they don’t, I would recommend this stop. First take time to view the 30 minute video which chronicles Cripple Creek history. All of us agreed it was an excellent production. Downstairs you will find an old buckboard and Studebaker hack as well as Native American displays. We stood and admired the miniature recreation of Cripple Creek’s downtown buildings and its surrounding mines. This display is interactive providing additional information on the mines when you push buttons. It also has a tiny train which runs around the town’s track. Upstairs, view a Stegosaurus dinosaur, Colorado wildlife, gems and minerals, and fossils from the Florissant National Monument. The main floor is the place to collect area brochures and see extensive exhibits on gold mining, products where gold is used, railroads, mining life, and the Ute nation. You can’t help but admire the views of Cripple Creek and Sangre de Cristo Mountains from the floor to ceiling window acting as the center’s back wall. We drove back to Colorado Springs where we had dinner at an excellent Chinese restaurant, Shangri La. Then we stopped for a visit with the Cards at their home. What a delightful day!